In the morning on July 26th, Mr. Lê Văn Tâm – Standing Vice Chairman of Cần Thơ city People’s Committee and leaders of Thốt Nốt district came to visit and offer gifts to policy families in Thuận Hưng and Tân Hưng wards. Meeting with families at Tân Hưng ward people’s committee, Mr. Lê Văn Tâm briefly informed the socio-economy and national defense of the city in the first 6 months. 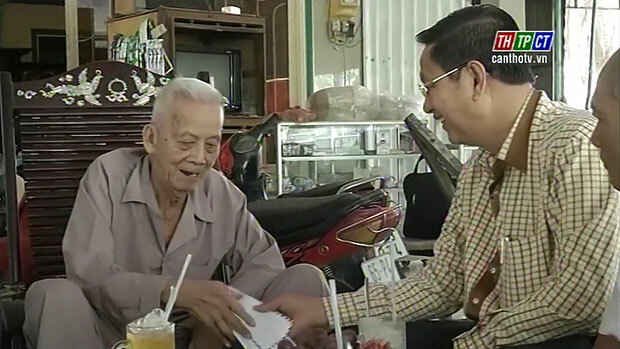 Mr. Lê Văn Tâm offered his gifts to a policy family. He emphasized that the achievements the city has gained since the beginning of the year is contribution of policy families, mainly in Thuận Hưng and Tân Hưng wards. On behalf of leaders, he acknowledged contribution of families to national protection, especially policy families. He considerately asked health of family members and hoped that they continue promoting revolutionary tradition to overcome difficulties, to build well residential zones./.